My kids are lounging around the house today, but there's a tinge of apprehension in the air. We're headed to open house tonight to meet their new teachers. 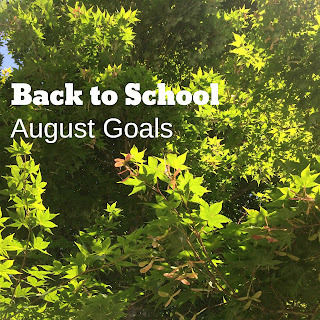 For me, that means it's time to transition from summer fun to being an intentional public school mom who communicates effectively with my children's teachers. I'm also starting to think about totschooling. My two-year-old is really interested in learning her letters right now. One activity per child every day turned out to be every second day, but I did have some good time with them. I caught up the sewing and organized the kids rooms. The papers are still sitting there- I 'd better get to them! Several if my best summer posts have been updated and were e-mailed to my subscribers. Y'all, I have a problem. I never considered myself "crafty," but these little projects are disrupting our flow. Last night I made two lists in my planner. One is projects I'd like to do, the other is projects that are in the house and must be caught up first. No new projects, not even a winter garden until everything is caught up, cleared out and organized. August- November is one of the two productive times of year for me. I would really love to finally present my family with those photo books and start 2017 with a clean slate. During August I hope to thoroughly update and categorize my kids' science activities so that they are easy to find. I hope the rest of your summer is refreshing and your back to school goes smoothly. I am impressed with how much you got done in July! I love your no new projects goal. Thanks! I have to admit, the Target trip was a little tough this morning.